If you want a really tasty roast chicken without too much fuss, then this garlic roast chicken recipe is for you. 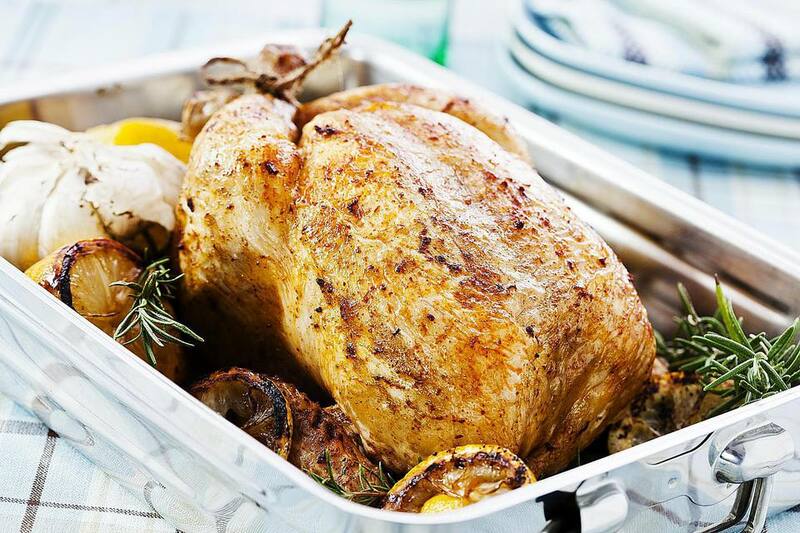 The chicken is stuffed with lemon and bay leaves then roasted in a delicious sauce of white wine, rosemary, and 20 garlic cloves. While this may sound like a lot, the dish is not overly garlicky. The garlic is roasted in its skin and imparts a delicate flavor to the white-wine sauce. Pair it with one of these delicious Australian and New Zealand side dishes, including salads and roasted vegetables. Heat the oven to 375 F (190 C). Wash the chicken and pat dry. Place lemon halves and bay leaves in the chicken cavity. Tie the legs together with kitchen string. In a small bowl, mix together the olive oil, rosemary, and salt. Rub mixture over the entire chicken. Place the chicken in a large baking dish. Set aside. Bring the chicken stock, white wine and garlic cloves to a simmer in a medium saucepan. Pour the liquid and garlic cloves into the baking dish around the chicken. Cover baking dish with foil, crimping the edges tightly around the dish so that no steam can escape. Roast for 1 hour 20 minutes. After this time, remove chicken from oven and remove the foil. Place chicken back in the oven, and roast for another 20 minutes or until the chicken is golden brown. Remove chicken from the oven and loosely cover it in tinfoil. Let it rest for about 15 minutes. Spoon the sauce from the baking dish into a saucepan, and keep it warm. You can strain some of the garlic cloves into the sauce, or just keep the cloves whole. Serve chicken with garlic sauce on the side. Place a few garlic cloves on each plate so that guests can squeeze garlic onto the chicken if they wish.